In today's fuel additive market there is a huge choice of products available to commercial consumers in the rail industry that claim all sorts of performance gains. Most of those claims are either unproven or untrue. The painful experience of most commercial users is that most of these products simply don't work. Fact - 98% of fuel additives on the market today are solvent-based cleaning products that simply clean dirty engines parts to improve fuel efficiency back to factory baseline. As well as cleaning engines, FPC contains a unique catalytic compound (ferrous picrate) that is proven to increase engine combustion and fuel efficiency in any engine. Fact: FPC is so effective it can even improve the performance of a brand new, completely clean engine - something none of the competition can do. Fact: FPC is based on real science and has been tested over 2,556 times in different applications and industries including 117 tests on locomotive engines serving the mining industries (for details information on the tests please contact us). No other fuel additive has been tested as much or is proven as effective. Fact: Ferrous Picrate was first used to improve fuel performance back in 1940’s and has more than 30 years of independent testing by fuel test laboratories proving it has never damaged any engine in any way. Modern engines leave small amounts of unburned fuel after each piston stroke. Ferrous Picrate makes it easier for your engine to burn more of the fuel injected in to the cylinder. It acts as an agent between the oxygen in the air and the carbon in the fuel, reducing oxidation and ignition delay; which in turn creates a faster flame speed and more complete combustion. This results in better economy, more power, increased cylinder pressure and smoother more complete combustion, which means less toxic gas and PM2.5 (soot) emissions. The ΔH is known in chemistry as an enthalpy and represents the energy created from the thermo-dynamic process that takes place inside your engine. The CxHy represents the fuel, for example diesel is C12H26. The CO2, H2O, CO, HC, and C to the right represent exhausted emissions. There are no exothermic (energy producing) reactions that can yield more energy out of the CO2 or H2O, so we've grouped these together. However, there are exothermic reactions that can extract additional energy from the second group: (CO + HC + C). 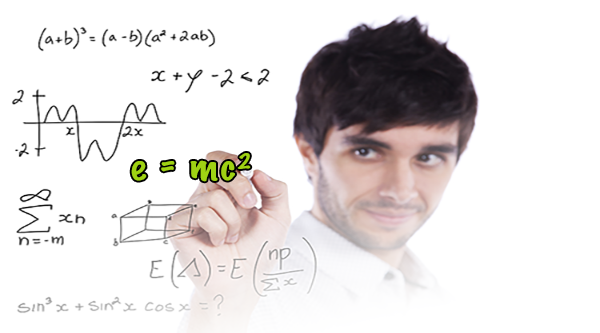 ΔH's in the above equations represents how FPC increases your engine's output. These additional ΔH's add to the original ΔH produced by the engine's normal combustion process, to deliver a measurable increased energy output from the engine. This extra energy can be used to either increase engine output power (if fuel input is constant) or reduce the engine's fuel consumption (if output power is constant). An engine only has a limited amount of time to burn the fuel injected into the combustion chamber before excess fuel is vented via the exhaust manifold. Without FPC, fuel in the combustion chamber is ignited from a single point at the top, and burns down to the piston head. 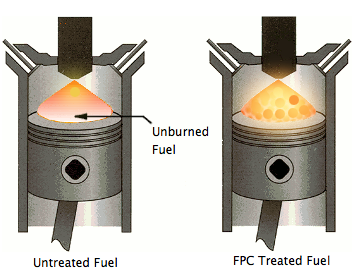 Because FPC acts as flame initiator, its molecules propagate multiple ignition points inside the injected fuel. Which results in a more complete fuel-burn and less wasted in the exhausted emissions. Sensors inside laboratory engines have shown that FPC changes the pressure cycle inside the combustion chamber. 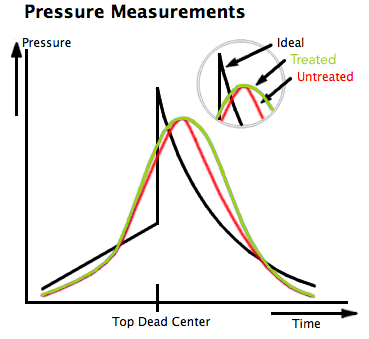 Because the average pressure is increased, the piston receives more force to drive it down. If the piston is driven down faster, more power is delivered to the crankshaft – This results in measurable power improvements. Proof of this increased power is shown in the graph above, as you can see the area under the curve for FPC-treated fuel is larger than the area under the untreated fuel curve.